I’m sure by now you’ve heard the hype about the group fitness studio Orangetheory. With franchises all over the country, I’ve heard it’s praise from my uncle in Michigan to my coworkers in D.C. And, because every studio offers your first class for free - there is absolutely no excuse not to try. After years of putting it off, I finally tried Orangetheory! I hit up their newest D.C. location on Capitol Hill for their late Saturday morning class. Long story short, I loved the class. I love interval-based training classes and this one did not disappoint. Whether you’ve been anxious to try this workout for years or have never even heard of the studio before, here are some things to know before you go. Orangetheory classes are different every day and can focus on endurance (longer exercises/lower weights), power (shorter sprints/heavier weights), or a mix of everything. Regardless of what the class format is, you’ll always have a cardio portion and a floor portion. The cardio portion is mostly treadmill work and, if you’re anything like me, the most intimidating part of the class if you’re not a big runner. With the treadmill workout, your coach will give you targets of where to be in terms of pace and will let you know when to increase your speed or incline. You are in total control of what you do on the treadmill, so if you don’t feel like increasing your speed when you’re told to - you don’t have to! You also have the option to power walk on the treadmill or jump on a stationary bike if the treadmill is not right for you. Depending on the class, you may also see the rower incorporated into your cardio half of class. In the weights portion of class, you’ll do a circuits of two to four exercises that your coach will describe as you go. They also have monitors reminding you of the workouts that you’re doing and visuals of how to do them - I really appreciated that touch! Your coach will come around and correct your form if needed and offer encouragement. An example of one of the circuits we did during the Floor portion of class. For those checking out the class for the first time, I’d recommend starting on the cardio portion at the beginning of class (get that over with first!). To opt to do that first, you’ll pick up a Treadmill card with an assigned treadmill before the start of class. When I first heard about this feature of the class years ago, I thought a heart rate monitor seemed pretty extreme and reserved for those people who were trying to get it peak physical condition. In reality, that’s not the case at all. 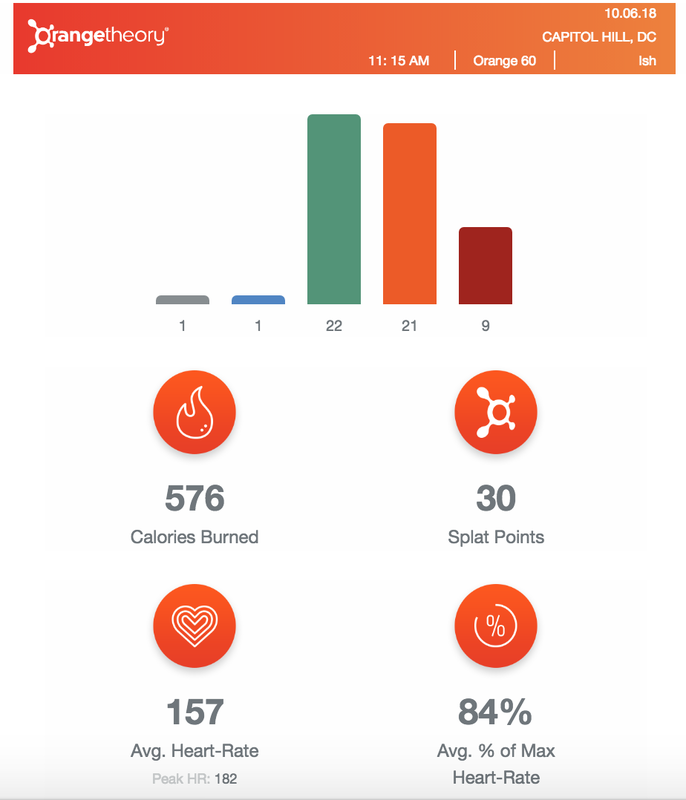 Orangetheory uses the heart rate monitors to help you keep tabs on how hard you’re working - not to shame you into slowing down, but to make you aware of how your body is working so that you can adjust (either push yourself or calm it down) based on what you heart rate is telling you. Your heart rate output will let you know if you’re in the Blue (resting), Green (easy exercise), Orange (push), or Red (all out) zones. They encourage you to try to spend 12 to 20 minutes in the Orange zone to reap the full benefits of the class and continue burning calories up to 36 hours after the class. I found the heart rate monitor to be a good tool to gauge when I could push a little harder and when I should just keep up at my current pace. They said that it takes a couple of classes for you to understand how to read your heart rate and what works for you. For example, they tell you to avoid spending a lot of time in the Red Zone, but I found that sometimes I was comfortable there and made the choice to stay there. It was also a great reminder during the Floor section for me to try a heavier weight or pick up my pace if I was in the Green zone for too long. Here are the stats that I received after my first class. I was able to keep my heart rate in the Orange zone for more than 12 minutes, which means I kept burning calories 36 hours after class. All the ice cream, please! Overall - heart rate monitors are there as a tool for you to use as you see fit. You can monitor it dutifully or you can ignore it entirely. The choice is 100% what is right for your body on that day and you’re only competing against yourself - no one else in the class. The Class Isn’t Crazy Intimidating! For so long, I was intimidated by people who went to Orangetheory all the time and thought that there was no way I’d be able to keep up with everyone else in class. The truth is, the class really isn’t about anyone else - it’s only about you. In terms of pricing, I assumed that the prices would be insane because they weren’t listed. In reality, they’re no different than other boutique group fitness classes in the area (which certainly doesn’t mean they’re cheap) and have a variety of membership or class pack options to fit your schedule. At least for Capitol Hill, I can tell you that one class runs you $28 (less per class if you buy a package), which is cheaper than Barry’s Bootcamp by $6, for what that’s worth. That said, this is one studio that I’d seriously consider sucking it up and paying a membership for because you really do get your money’s worth in terms of calorie burn at this studio. I burned over 620 calories and got a full-body workout. Sign.me.up. So clearly, I’m a fan. I’m curious - would you try Orangetheory? What’s holding you back?